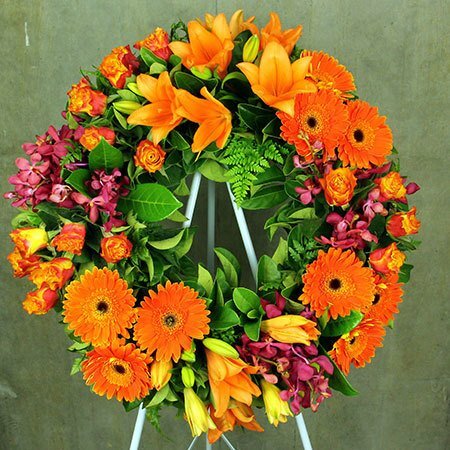 Our fresh floral tribute wreath for funerals has been designed by the florist team using bright orange gerbera daisies, sunset coloured roses, deep pink vanda orchids, orange Asiatic lilies and greenery. Available in three different size options, you can order these funeral flowers online or call our friendly consultants on 1800 66 66 46. 2017-01-18 I purchased sympathy arrangement for a funeral on line. The flower arrangement looked exactly like in the photo and they were delivered in time. I was so pleased and will definitely go back.